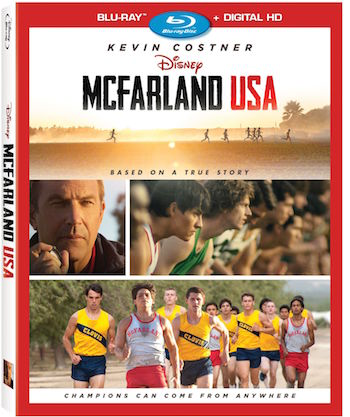 SYNOPSIS: In the tradition of Disney sports movies comes “McFarland, USA” based on a true story of underdogs triumphing over tremendous obstacles. This heartwarming drama follows novice runners who strive to build a cross-country team under Coach Jim White (Kevin Costner) in their predominantly Latino high school. Everyone has a lot to learn about each other, but when Coach realizes the boys’ exceptional running ability, things change. Beyond their talent, it’s the power of family, commitment to each other and work ethic that transform them into champions — helping them achieve their own American dream. CAST: Kevin Costner (“Dances with Wolves,” “The Untouchables”), Maria Bello (“A History of Violence,” “Prisoners”), Carlos Pratts (“Paranormal Activity: The Marked Ones,” “Out of the Fire”), Morgan Saylor (TV’s “Homeland,” “Cirque du Freak: The Vampire’s Assistant”).